Solder balls can be formed in one of two ways – stamp and reflow or solder jetting. The stamp and reflow process starts with either solder wire, or a sheet of solder material. The solder wire is cut into small cylinders, which are then subjected to an elevated temperature to reflow them into solder spheres. The sheets are stamped into small cylinders and reflowed to create solder spheres. The reflow operation is accomplished by dropping the cylinders into a liquid thermal transfer medium that is stable at the liquidus temperature of the solder alloy. The medium is also a material that is inert to the solder itself, such as Fluorinert. Once in the medium, the cylinders will liquify and form spheres. This occurs because the solder attempts to minimize the free surface area. The spheres can then be collected, and the liquid medium residue can be removed using a solvent such as acetone. The second method is solder jetting. 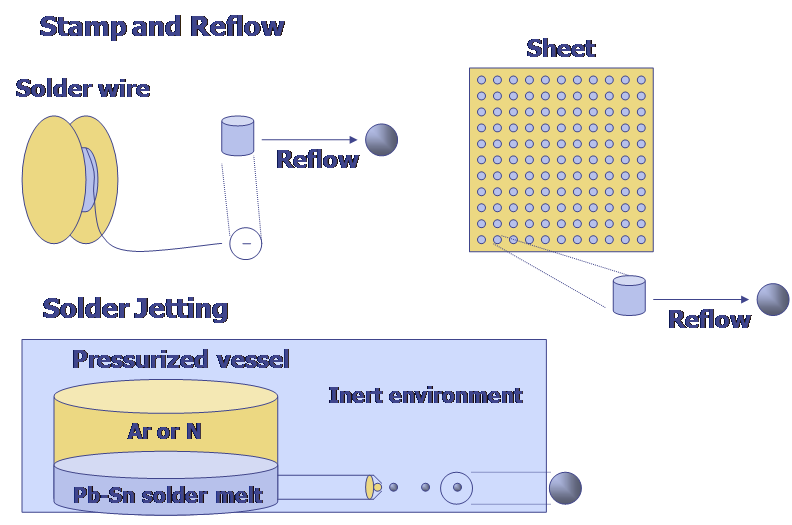 In the solder jetting process, solder is melted into a liquid in an inert environment such as argon or nitrogen. Elevated pressure on the inert gas forces the liquid solder through a small orifice. This action, coupled with a periodic impulse and a small amount of oxygen, breaks the stream into small droplets. The size of the droplets can be controlled by the overpressure and the size of the orifice. The spheres are then cooled in an inert environment and are collected for use. We have continued to expand our online training materials over the past year. We have added a significant amount of new material in the reliability section, as well as new material in a number of the other sections. Our material contains flash-based courses, quizzes, and interactive exercises, as well as PDF materials for off-line reading. Call us at 1-505-858-0454, or e-mail us at info@semitracks.com for a free trial account. Semitracks makes some of its materials available for free on our website. At this time, the reference material contains some basic information on some design and failure analysis topics. To access this material, please visit http://www.semitracks.com/reference-material/. Semitracks continues to expand its course offerings this year with new courses and new locations. We are also offering several courses in India for the first time this spring. For more information on these courses, and our courses in North America and Europe, click on the links below.